Time Warner does it again! So, sometime day before yesterday our yard was surveyed so the bright-orange cable line that’s been lying across our yard and down the hill to the street-side cable hookup for the past three weeks can finally be buried. Three weeks was long enough, and I’ve gotten tired of mowing around the thing, so we think it’s great to see a little paint on the lawn. But wait, it’s not great. They only surveyed outside our fence. Why? Fear of a dog in our back yard (we don’t have one)? They also didn’t bother knocking or ringing our obnoxiously-loud doorbell to ask, either, because we were home all day. So who knows what’s going to happen. We decide to wait and see, since calling anyone at Time-Warner almost always leads to more confusion and delay. And yeah, we know that it’s not Time-Warner’s fault the survey wasn’t done properly, because they’re not the ones that do the surveys. But we also have years of experience interacting with them, and calling Time-Warner to ‘fix’ something is rarely straightforward or simple…as you’ll soon read (again). A couple of guys showed up yesterday to bury the line. Contractors for Time-Warner. They look like a father-son duo, and they’re certainly nice enough to me. I tell them the area inside our fence hasn’t been surveyed for some reason, so I don’t know what they plan to do. The ‘father’ of the crew whips out his phone, talks to someone, hangs up, then tells me he’s called in a one-hour survey and that he’ll be back in a couple of hours to get the line finally buried. My jaw nearly dropped. I’m actually astounded that someone related to Time-Warner in any fashion can actually pick up a phone and Make Things Happen, Right Awayâ„¢. So they leave. Some time goes by. Eventually I’m back outside with our oldest son, and we notice fresh paint lines on our inside-fence lawn. Survey done. Wow, progress! A short while later, the ‘father-son’ team shows up again to finally bury the line. They knock on the door, let us know our cable-related services will be down while they disconnect the line to bury it properly. No problem, I say…go for it. So they get to it. We talk some more a bit later about watering the trench so the grass doesn’t turn brown, and hey, they seem like decent guys. I let them get back to work finishing up packing the trench, reconnecting the street-side connection, etc. So I run down to my office to verify things are working. I take a look at the cable modem lights. No connection. Would it have been that big of a deal after talking to me several times already to just check in that one last time and make sure everything was working again? In my opinion, verifying everything is working as it should is a must-do upon completion of any service one performs. First call to the Time-Warner 800 number gets me “Demetrius”. I explain the situation to him. I tell him that the line-burying guys just left, mere minutes ago, and if someone could simply call them, they should be able to come right back and take care of things right away, as it’s obviously just something they messed up in the street-side box. He puts me on hold for a while. I was probably on the phone with him about 10 minutes, including hold time. He eventually tells me I should be getting a call from a local dispatcher in the next 15-20 minutes. I give him my wife’s work cellphone number as the only way to reach us, which he understands and notes in our account. I ask what I should do if they don’t call (as this has happened to us more than once before), and he tells me to call back. Of COURSE that’s how it should be… Bzzzt. About 20 minutes later, I get a call from a woman whose name I no longer recall (update: from her voicemails after this incident was finally resolved, her name is Toni). Total time of call was about 15 minutes, including hold time. I explain what’s happened, and how I’d like her to call the contractors and get them right back out to finish their job correctly, as they clearly didn’t. And here is where things go the most wrong, death-spiraling into Time-Warner-knows-better-than-you hell. Again. Toni insists the cable reconnection isn’t the job of the cable-burying crew; she tells me that all they do is bury the lines, and if there’s an issue with my connection, she’ll have to find a regular Time-Warner line technician to come out. She refuses to believe me when I tell her that the line-burying guys DO in fact unhook the cable line so they can bury it, and what this is isn’t a general failure of my cable connection, or anything requiring a technician, but a simple case of a crew that didn’t complete their regular work correctly and should be easily fixed by them, as it IS part of their job. She puts me on hold. She eventually comes back and tells me she’s having trouble finding someone to help me and she’ll call me back in 20 minutes. I say fine, and there I sit again, no closer to resolution than before. So for the next HOUR, I’m walking around with my wife’s work cellphone in my hand, getting nothing done, waiting for them to call back. At the one-hour mark, I call THEM back at the 800 number again, as I’m thinking I’ve waited long enough. By this time, it’s almost 4 PM, and the day is getting away from all of us. I get another completely different person this time (Rosa?). Total time of call was around 20-25 minutes, going nowhere fast. Our call was peppered with severely long hold times several times as she conferred with people. At one point, Rosa tells me that I was called back and a voicemail was left for me. Umm, no. 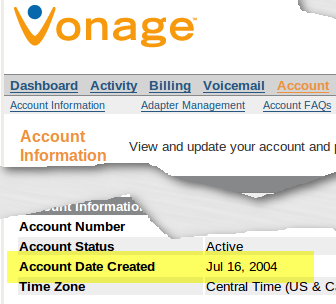 Apparently Toni–who correctly called my wife’s cellphone number the first time–called back on our regular home line…which is the Vonage line we can’t answer with our cable/broadband connection down. Way to go, Toni. Our going-nowhere-fast, series-of-loooong-holds call with Rosa was actually cut short by Toni via call waiting, finally and correctly calling me back on my wife’s work phone. At this point, it was an hour and 20 mins since she told me it would be 20 minutes. Toni’s actually rather snotty about everything. Says she talked to “technicians that installed the cable line” and they’d get a crew to come back out “today”. “Today”? Seriously? She tells me she “called me already about all this” (paraphrased), but makes no mention that she called the wrong number.Â Fine, “today” it is, then. I’m clearly not going to get any better answer, so I guess I’m stuck waiting, once again not knowing if/when anything will happen. About 45 minutes later, the original line-burying duo shows up to fix the line. Turns out when they redid the street-box cable connector, the stinger wasn’t left long enough. The line wasn’t buried quite properly at the enclosure, either. I get the impression the younger guy’s in training. The ‘father’ also tells me he saw me talking to the ‘son’ close to their completion of work, so he thought we’d had a conversation verifying everything was up and running OK… Oops. Anyway, it’s all working again. The fix was simple, minor, and quickly and easily resolved…just as I expected and explained it would be. It was down about five hours altogether for what should have been 15-30 mins, max. Not bad for Time-Warner, I suppose, but still ridiculously unacceptable. And let’s be clear: we don’t have a problem with a single instance of a worker (in training or otherwise) screwing something up. These things happen. What we don’t like is the it’s-not-us, we-know-better-than-you attitude and the presumption of customer stupidity that emanates from Time-Warner’s Customer Service/Support. If they had called the line-burial guys back right away when I first called in, we likely would have been up and running again right away. In the hour I spent doing nothing but waiting for a callback from Toni, I could have driven around our entire town and found a Time-Warner truck and technician on my own. Never mind the lost productivity (and earnings) from the downtime, which of course Time-Warner never feels is their responsibility even when the outage is their own damn fault. It’s shocking and ironic that Time-Warner’s in the communication business, when they’re so incredibly poor at it. All we’ve ever wanted is what we’re paying for to work. When it doesn’t work, we want competent and responsive service. Time-Warner proves time after time that these most-basic customer expectations are almost entirely unreasonable. We got a voicemail (during all the aforementioned downtime, go figure) from a Sam Olmsted (sic? ), a manager with Time-Warner Business Class Services regarding this very blog. Someone with Time-Warner–somewhere–finally notices. I can’t shake the feeling, however, that it’s probably a sales call instead of real assistance. I half-expect to hear something like “With Biz Class service, you can get real QoS and guaranteed uptime!” I suppose I should call him anyway and see what he wants. Anything’s possible, right?